When you’re revamping your home, you may be stuck on some fundamentals, like knowing how high to hang a painting or how big your rug should be. Here is a handy collection of interior design rules — some general, others more specific — to get you started. Create layers but don’t overdecorate. The definition of too much depends on your own sensibilities, of course, but do avoid the temptation to throw everything at a room all at once. Think of your particular space in terms of layers to be built up — color, texture, pattern, fabric, surface treatments, lighting, pictures, plants, books — and go with what you love, rather than whatever is trendy. This quietly elegant but richly detailed living room is proof that individual style always outlasts fashion. Give your sofa breathing room. For a comfortable living space, think about practicalities as well as aesthetics. As a rule of thumb, allow 18 inches between the seating and a central coffee table. Any less can feel like a squeeze, but too much more can prove uncomfortable when reaching for a drink or a book. Also, make sure the coffee doesn’t overpower the room. The proportions tend to feel right when the table is about one-half to two-thirds of the sofa’s length. Size up your rug. Too many beautiful rooms are ruined by rugs that aren’t the right size. A standard 6-by-8-foot rug is often fine in a midsize room but can look skimpy in a big space. Ensure that at least the front two feet of your sofas and chairs rest on the rug to prevent it from feeling as though it’s going to float away. It’s worth hunting around to find a rug in a larger size, and many retailers have a decent selection at reasonable prices. Alternatively, save up for something special or consider a custom piece. The effect the rug has on the room may be worth the investment. Nail the curtain length and width. Like trousers, curtains shouldn’t be too short. To show yours off to their best effect, ensure that they either kiss the floor, as these do in this open-plan living space, or puddle luxuriously. The combined width of your curtain panels should be 1½ to two times the window’s width. For extra-wide windows, such as this one, it’s worth looking at double-width fabrics (generally up to 118 inches wide) since there will be fewer seams. Match a fabric to its purpose. When you’re picking a fabric, form should never undermine function, so make sure you go for a material that’s suited to the purpose for which you intend to use it. For example, if you need blackout lining for your window, don’t choose a fine voile, or if you require a soft, tactile fabric for a child’s bedroom, avoid a stiff linen. Be smart about hanging art. One of the most important rules for hanging pictures and paintings is not to position them too high. They should have a human scale — that is, they should be hung in relation to the people in the room, not the room itself. The perfect height is at average eye level, or about 58 inches from the floor to the center of the picture. If you are creating a gallery wall, as shown here, the main picture should be hung at eye level, with the others arranged in relation to it. There are exceptions, however: If you have a favorite, smaller picture, try hanging it above a side table or next to a lamp, which will give it a more intimate scale. Know key kitchen measurements. There are many measurements that are important in creating an aesthetically pleasing and safe kitchen. Standard lower cabinets are 24 inches deep. A good rule of thumb is to keep 48 inches between parallel rows of lower cabinets to allow for safe movement even when the doors or drawers are open. However, 42 inches can work in a pinch. The smallest recommended size for a kitchen island is about 40 by 40 inches, and for counter stools, you should allow at least 12 inches of countertop overhang. Position dining tables and chairs properly. Pay attention to key measurements when you’re positioning your dining table and choosing the chairs to go around it. Each person (and therefore chair) around a dining table should have about 24 inches of space to avoid bumped elbows and knuckles. It’s generally recommended to have 36 inches between the edge of the table and either the wall or another piece of furniture to allow people to get around occupied chairs. For most people, the seats of dining chairs will be most comfortable if they are about 12 inches below the tabletop. Get the right dining light. When choosing a pendant or chandelier to hang above a dining table, aim for a light fixture that’s one-half to two-thirds of the table’s width. This will ensure that everything is in proportion. 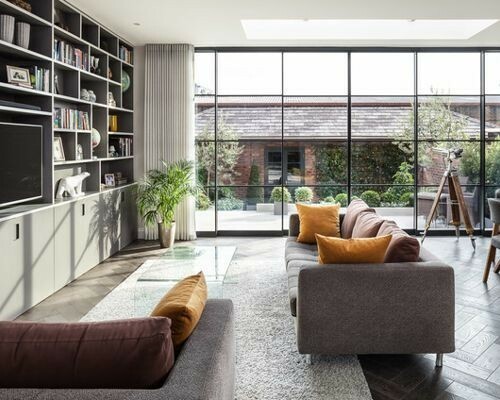 For long, slim light fixtures, such as the one in this contemporary barn conversion, maintain the same ratio of one-half to two-thirds, but apply it to the table’s length. Understand lampshade proportions. Believe it or not, there are rules that apply even to the size of a lampshade relative to its base. And thank goodness for that, since limiting the selection makes the decision easier. The height of the shade should be roughly three-quarters of the base’s height, while the widest part of the shade should measure about the same as the height of the base. If you’re stuck deciding between sizes, go for the larger of the two since the light distribution will be better. However, if you have a tall and narrow base, a smaller shade will look more elegant.